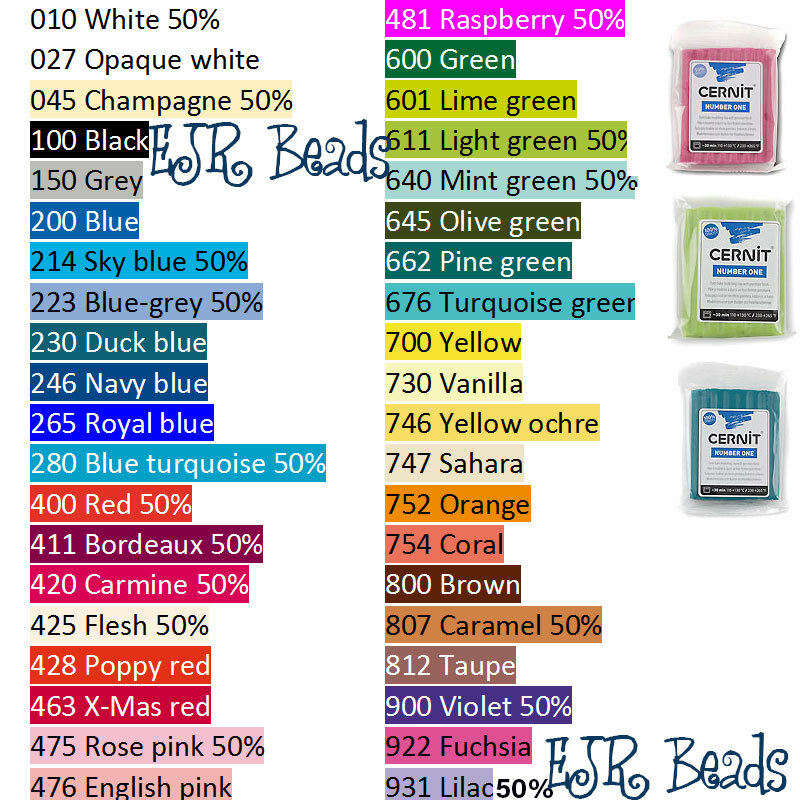 Number One - This is the standard range of colours, sold in 2 oz / 57g. Unlike most polymer clays, many colours in the Cernit Number One range have what is called a "porcellaneous" finish, with the colour's opacity value shown as either 50 or 100% - the lower the number, the more slight translucency to the colour once baked. It is this quality, along with the wide range of flesh tones, that makes Cernit such a popular choice for doll makers. Cernit is also a fantastic beadmaking clay - the colours are superb and rich, it canes well and it is very strong after baking. It moulds and takes detail extremely well too. Click on any of the colours below to see example blocks and some pretty flowers made by my mum! Don't forget to click through to pages 2,3 and 4 to see the full range of 34 different Number One range colours! Cernit Polymer Clay - 211 - Caribbean Blue - NEW COLOUR! Cernit Polymer Clay - 212 - Periwinkle - NEW COLOUR! Cernit Polymer Clay - 423 - Peach - NEW COLOUR! Cernit Polymer Clay - 603 - Spring Green - NEW COLOUR! Cernit Polymer Clay - 620 - Emerald Green - NEW COLOUR! Cernit Polymer Clay - 739 - Cupcake - NEW COLOUR!